Numerous negative experiences with HostGator and GoDaddy web hosting sent me packing. I’m glad I landed at SiteGround. At some point, I became so frustrated with my website hosting provider, I dropped everything and spent the necessary time researching alternative hosting solutions and made the jump. With the number of projects on my plate at the time, I had no business taking on a migration project but given my level of frustration, I was highly motivated to make it happen. Truth be told, this happened to me not once but twice starting with GoDaddy. I got fed up with their support (or lack thereof) and moved to HostGator. A few years later, I hit the same frustration threshold with HostGator and moved over to SiteGround. Thankfully, now that I have been with SiteGround for over six months, I can honestly say I’m very satisfied with the level of support as well as their feature-rich hosting plans. This web hosting review details some of the frustrations that led to my landing at SiteGround and the reasons I’m one of their many satisfied customers. One of the problems with GoDaddy was the fact that their technical support was extremely inconsistent. Some days, their rep was knowledgeable and seemed genuinely interested in resolving the problem but more often they lacked the necessary technical knowledge. To add insult to injury, some of those reps came across as if they could not care less. Now, I don’t expect them to be a bundle of joy when I call with a hosting related issue but some perceived level of interest in achieving a solution would be nice. The straw that broke the camel’s back involved multiple client sites (my clients) experiencing periodic downtime due to connection timeouts and internal server errors. Eventually, a GoDaddy support tech acknowledged that the problem was on the GoDaddy server side but getting to that point was time-consuming and painful. After my initial call to GoDaddy got me nowhere, I spent hours troubleshooting the client (WordPress website) side with no success. A day later, once I was convinced the problem was on GoDaddy’s side, I made numerous calls to GoDaddy support and finally got in touch with a tech who explained that the hosting account in question was old and running on a legacy server. He didn’t offer a solution; he simply said the account was old and the server it was running on was old and its obsolescence was the reason for the instability. The implication was that the burden was on the customer to upgrade their account to resolve the problem. Unbelievable. I found it hard to understand why GoDaddy did not proactively reach out to these so-called legacy account holders and let them know the situation with the aging equipment and the associated risk for downtime. They should have come up with a plan to get those accounts to a stable, modern server. After all, it was their aging infrastructure causing the problem. As it turned out, several of my clients were having this server instability problem during that time period. Coincidentally, they all had opened their hosting accounts with GoDaddy five or six years earlier. The only reason I knew about the intermittent downtime was through a free, third-party website monitoring service called Uptime Robot which I had set up for each of my clients early on. One client opted to have GoDaddy upgrade his account to their next level hosting plan and, ironically, after GoDaddy techs finished moving his site to a more stable server, I found that they failed to move all the image files. The site looked like a website under construction – a complete mess. Strike three. GoDaddy web hosting was out. In the beginning, HostGator was great. And throughout my research, I’ve noticed that to be true for numerous other website owners as well. So, what changed? For me, it again came down to support – a lower quality of support compared to my initial time with them. In my first HostGator example, I submitted a support ticket asking for assistance/direction regarding a site backup file that came up as malicious in a malware scan which I ran on my website. 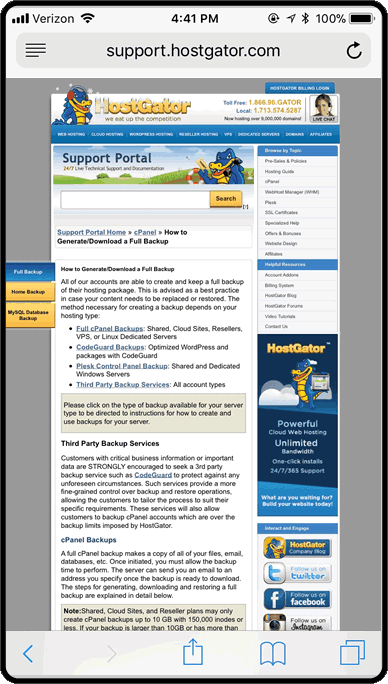 The backup file was created on a HostGator server with their cPanel backup utility. Prior to the creation of that backup file, my website came up clean using the same exact malware scanner. In my support ticket to HostGator Support, I was simply looking for an opinion as to how this could happen or any theories they might provide. We have scanned your account, and we did not locate any malicious files or injections. It is your responsibility to ensure the security of your account(s). If we detect another compromise within 6 months of this notification, we will be forced to temporarily restrict access to the account in order to protect our network. We also reserve the right to assess an Account Cleanup fee before restoring access to the account. If you have any questions, please let us know. HostGator’s threatening response to my request for assistance. I was simply looking to HostGator for some support; for any theories they might have as to how the backup utility on their server could create a zip file that tested as malicious when my entire site came up clean before the backup file was created. Instead, I was threatened. Nice. That’s an effective approach if your customer support strategy is to destroy goodwill and reduce the size of your customer base. Aside from the fact that their Senior Security Administrator is in need of an English Composition 101 class (since his reply was illogical: there was no compromise but we’re going to charge you a cleanup fee if it occurs again…), it was quite unreasonable to threaten a paying customer who is simply requesting assistance. Based on that experience, I made up my mind to cut ties with HostGator. That was it. I wanted to drop them like a bad habit. In another interesting approach to customer support, HostGator did away with support tickets via email. That might have been efficient and cost-effective for them but it was terrible for customers. Support ticket submissions were limited to chat sessions and phone calls. The problem with that was I usually could not get through with either method without a ridiculously long wait. In some cases, I couldn’t get through at all! On more than one occasion, I could not get through to HostGator support at all! Wow. I was amazed at how far down hill HostGator had devolved compared to my initial time with them. To be clear, I believe that HostGator eventually re-instituted email as an optional method for submitting customer support tickets. However, I’m happy to say I’m not sure about that because I cut ties with them and moved to SiteGround. In addition to my horrible experience with HostGator’s customer support process, I found their documentation lacking in that it is NOT mobile-friendly. In this day and age when the majority of devices accessing the internet are mobile, it’s amazing that a company so central to the web industry is not completely mobile-friendly. The only way to read HostGator’s documentation while using a smartphone is to zoom and pinch and slide the page back and forth – clearly a bad user experience. To be fair, aside from the fact that they’re not mobile-friendly, HostGator’s help text is pretty good in terms of content. It covers all the relevant topics and the articles are fairly comprehensive. I suspect that those articles were authored in HostGator’s earlier, higher-quality days before they were taken over by EIG. HostGator was acquired by Endurance International Group (EIG) in 2012 which might explain their decline in quality in the years since the sale. Founded in 1997, EIG has acquired more than 80 web hosting companies and related businesses including major providers like BlueHost, iPage, FatCow, JustHost and HostMonster to name a few in addition to HostGator. It’s interesting to note, however, that EIG lists less than a half-dozen web host brands on their company website leading one to wonder if that’s because they want to keep their industry-wide influence under the radar. Many website owners and industry professionals feel that EIG’s impact has not been good for the companies it owns. 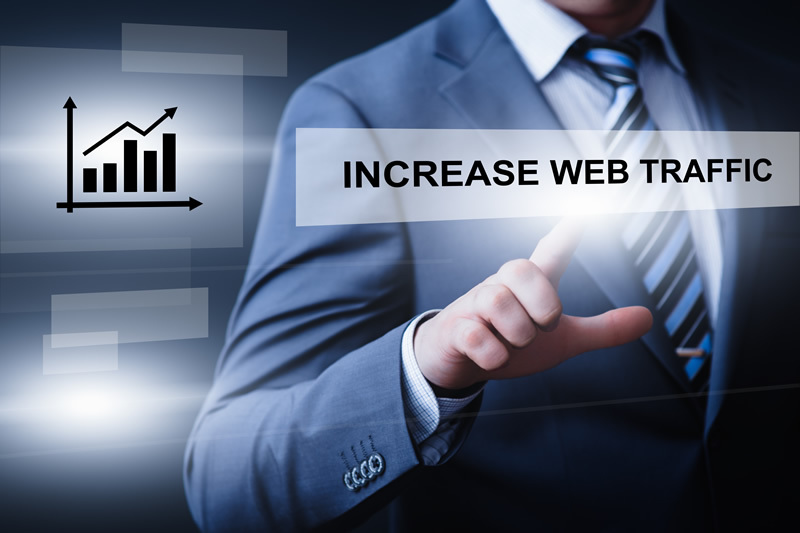 Simply do a Google search for EIG web hosting reviews and you will find a strong consensus that EIG has had a negative effect by centralizing operations and data centers across brands and by reducing or eliminating staff. While the centralized data centers probably made sense from a corporate office perspective, the resulting single-points-of-failure were likely to blame for massive service outages affecting multiple major web hosts. In light of this, an important factor for my next web hosting solution was that it NOT be affiliated with EIG. For that reason and the other reasons listed below, SiteGround was the way to go. 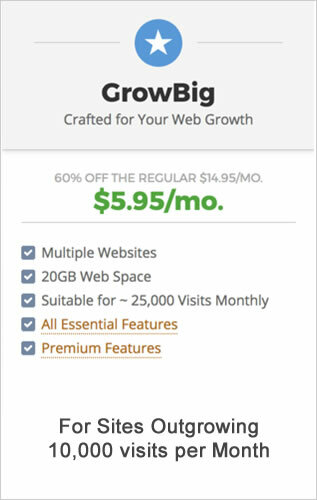 Before getting into my reasons for endorsing SiteGround, please be aware that some links on this website enable me to earn a small commission if the product is purchased. There is no additional cost to you if you decide to buy. With that in mind, it’s important to point out that I only endorse products that I have personally scrutinized and found to be useful in my web business and believe will benefit others. Articles like this one take time to craft so, if you find value in the information provided and plan on purchasing the product discussed, please consider using a link on this site. In any case, I hope you find this article useful. To avoid the negative experiences that came with HostGator and GoDaddy hosting, I created a must have list for my next web hosting solution. After a comprehensive search, SiteGround stood out and met all of my criteria. And now that I have been with them for more than six months, I can honestly say I’m very happy. Here is my list of requirements that led me to SiteGround and how they fit the bill. 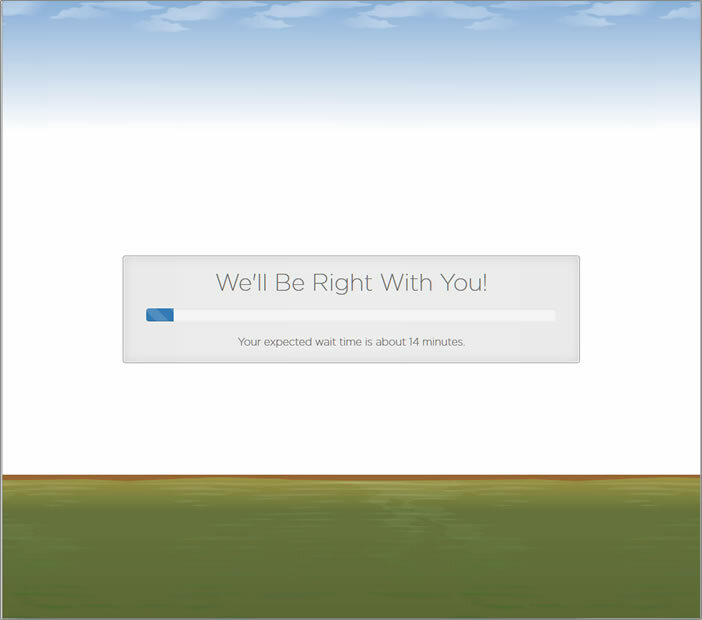 Quality support – In my experience to date, all of the first-line support techs I have dealt with at SiteGround have been knowledgeable and professional and wait times have been low or non-existent. Additionally, support ticket submission options include the normal methods you would expect: email, phone and chat sessions. To my surprise, the day after I opened my hosting account with SiteGround I received a call from a friendly SiteGround employee welcoming me and asking if I had any questions. I was impressed. Free SSL certificates (HTTPs) – SiteGround is one of the few major, non-EIG web hosts participating in the Let’s Encrypt Initiative which provides free digital certificates used to enable HTTPS (SSL/TLS) for website security. From an SEO (search engine optimization) standpoint that’s important because, in 2014, Google announced that it was starting to use HTTPS as a ranking signal. So, in addition to the important security benefit, no website should be without HTTPS if maximizing visibility in Google is an objective. For comparison purposes, at the time of this writing, basic SSL/TLS certificates start at $40/yr. at HostGator and $75/yr. at GoDaddy and they do not auto-renew (every 90 days) as does the free “Let’s Encrypt” solution at SiteGround. It’s worth noting that there are different types of SSL certificates: DV, OV, and EV. DV or domain validation certificates are provided with the Let’s Encrypt solution. Here is an explanation of some of the differences. Fast, reliable, and safe servers – Using a third-party uptime monitoring service (Uptime Robot) I verified that my site has had no downtime since it was migrated over to SiteGround more than six months ago. In all my years with GoDaddy and HostGator, that was never the case for a continuous 6-month period. As for speed, they’ve been very consistent. I have no complaints. cPanel available – cPanel is a Linux-based web hosting control panel that provides a graphical interface and tools to simplify the process of hosting and maintaining a website. (See Wikipedia for more.) 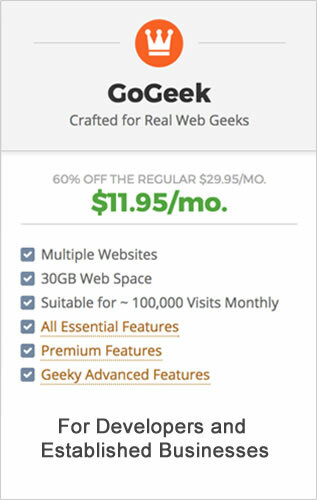 While many web hosts offer cPanel, GoDaddy did not offer it with my first site. Now as an experienced web professional and having used cPanel with numerous client sites over the years, I will not deal with a web host that doesn’t provide cPanel. 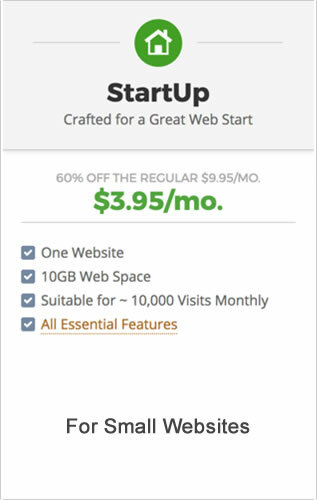 At SiteGround, cPanel is a standard feature even with their starter plan. Quality documentation – SiteGround has great documentation. Many of their knowledge base articles and tutorials are short and sweet yet they provide the answers you need. No fluff, just the facts. Current PHP and MySQL versions maintained – These are the foundation of the WordPress software environment and I am happy to report that SiteGround maintains compliance with WordPress’s version recommendations unlike GoDaddy and HostGator, in my experience. WordPress software requirements are clearly posted at WordPress.org. However, on multiple occasions, my hosting accounts at GoDaddy and HostGator fell significantly behind the recommended versions leaving my site (and others in the shared environment) vulnerable to hackers and plugin compatibility issues. Endorsed by WordPress.org – At the time of this writing, SiteGround was one of only three web hosts recommended by WordPress.org. To me, that’s a big deal. 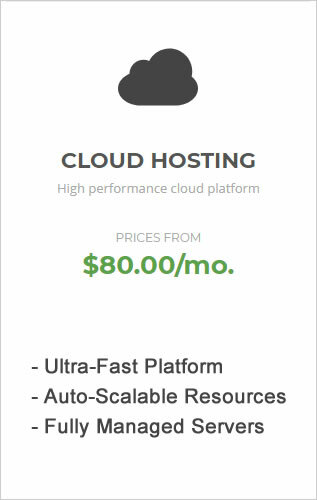 Reasonably priced hosting plans – SiteGround pricing normally starts at $9.95 per month but for some time now they have been offering a 60% discount. 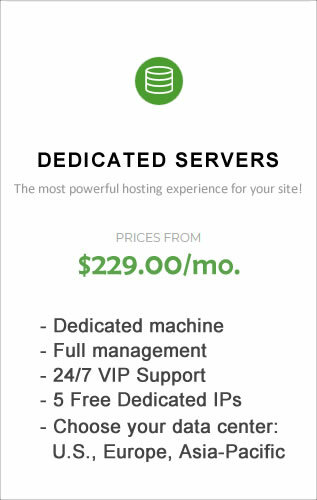 So, for $3.95 per month you can have a great hosting platform for your site with upgrade options available to you as your site’s traffic dictates down the road. Authored by: Robert V. Connelly, Jr. Overall, I give SiteGround a 4.9 star rating out of 5.0. In my experience, they exceed expectations on almost every level. Their web servers are fast and reliable as is their support. Check them out. 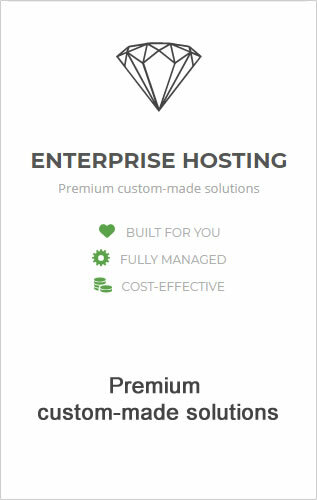 Click one of the cards below to learn more about SiteGround’s web hosting solutions. As you can see, they have a variety of hosting plans and platforms to suit every need. To check out a full feature list comparing the first three hosting plans listed above, click / tap the button below. From there you can place an order and take advantage of the 60% discount currently being offered.